In this week’s blog, Oversight Systems account manager Stephanie R. Yates-Anyabwile discusses how she works with clients to optimize their travel and expense (T&E) audit programs. How are most organizations identifying risk in their expense reports? Many organizations are still using manual processes to review expense reports. They’re relying on managers to review and approve them on the front end. Then, on the back end, they’re configuring expense management system’s audit rules and doing manual sample audits. However, these controls are static. They might be identifying some errors and defects like incorrect expense type selection, but it’s not helping assess or mitigate true financial risks. Manual audits aren’t the answer either. In most cases, you’re only looking at 20% to 30% of all your expense reports, so a lot of fraudulent and wasteful spending slips through the cracks. This exhausts resources for needle-in-a-haystack findings. An automated compliance monitoring like Insights On Demand® analyzes 100% of all expense transactions by employees – not just one expense report at a time. The system assesses financial risks by running hundreds of data analytic tests against all the data to find the hidden risks and problematic spending in all those T&E transactions. By focusing on repeat offenders and others who stray outside policy, you can reduce the exception rate significantly. In fact, this group, often becomes more compliant than the overall employee population. What can we learn about business travelers from analyzing all that T&E data? Based on our analysis of customer data, we find that about 70% of business travelers are fully compliant with their organization’s T&E policies. So that leaves about 30% of employees who do pose some kind of risk. 25% of these employees have minor infractions that require policy and procedure reminders. They may be violating your organization’s T&E policies, but there’s probably no clear malicious intent there. For example, an employee may exceed a daily meal allowance or book a hotel that is outside of the company policy. These individuals need policy education in the form of email reminders to nudge them into complying with your T&E policies. Only about 5% are committing intentional fraud, neglect, or abuse of the program. These are the repeat offenders. Who are these repeat offenders? Repeat offenders, while they are only about 5% of employees, are responsible for almost 95% of high-risk transactions at most organizations. Without an automated compliance monitoring system in place, these individuals are often able to evade detection for a long time. While a small number of people, they can do a lot of damage. For example, a recent Connecticut woman pleaded guilty to embezzling more than $1 million from her former employer through fraudulent T&E and purchase card expenditures during a three-year period. By focusing on repeat offenders, what kind of results can companies expect to see? Using Oversight’s repeat offender profile easily identifies employees with past issues confirmed by your team. You can reach out to employees or managers and escalate issues right from the tool to drive changes in employee compliance. The results can be pretty amazing. When employees realize their T&E transactions are being closely monitored, most fall into line. 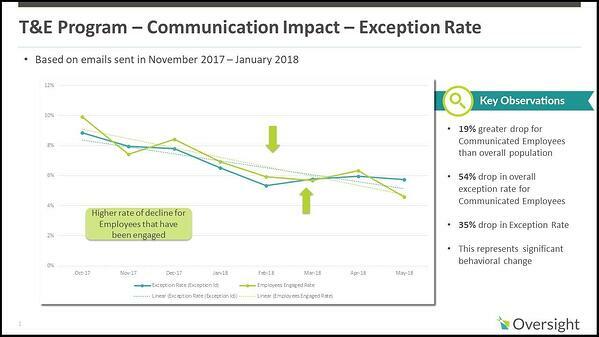 Clients have seen 50% declines in non-compliance among repeat offenders in just three to six months of employee engagement. In fact, within a year of implementing Oversight, we often find that these repeat offenders become more compliant overall than the general employee population based on the number of issues flagged. Identifying, addressing, and accurately reporting on repeat offenders is a vital control for every organization. Oversight streamlines this process, so that you have the assurance that you need about repeat offenders without the stress and time-consuming process of manually finding and tracking them on your own. Discover more ways to detect and stop waste, misuse, and fraud. Check out our Best Practices Guide for Mitigating Purchase Card and Travel and Expense Risks.